Enhance Your World with a New Standard in Wearable Technology. 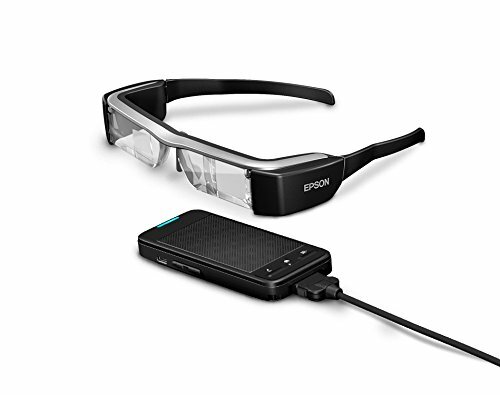 Get ready for the next generation of augmented reality platforms - the BT-200 from Epson, the world leader in projection technology. These binocular, transparent smart glasses open up a whole new world in entertainment, manufacturing, medical science and more. Unlike competitive models, each lens has its own display, right in your field of vision, projected into your surroundings. And, the BT-200 boasts 2x the virtual screen size, at a remarkably affordable price. These lightweight glasses work out-of-the-box with Bluetooth and other technology, plus most Android apps. With a front-facing camera and motion tracker, the BT-200 is a premier development platform for apps of the future and hands-free scenarios, delivering large, 2D or 3D images, front and center - virtually anywhere. From the world leader in projection technology - enjoy content in private while still experiencing the real world with the BT-200's innovative micro-projection and see-through imaging technology. Binocular, transparent, wearable display - view content, front and center, on a "floating" 80-inch perceived screen.